Gilead's high-flying days are seemingly over. Intercept Pharmaceuticals, on the other hand, is only getting started. Gilead Sciences (NASDAQ:GILD) has clearly lost its luster as a growth stock over the last three years, thanks to a suite of setbacks for its oncology and hepatitis C franchises, as well as an increasingly competitive HIV marketplace. Gilead's stock, for instance, has woefully underperformed the broader biotech landscape during the past 36 months. As this Goliath of the biotech world doesn't seem to have an answer to any of these underlying problems, at least in the near term, investors may want to start to look elsewhere for more compelling growth opportunities. 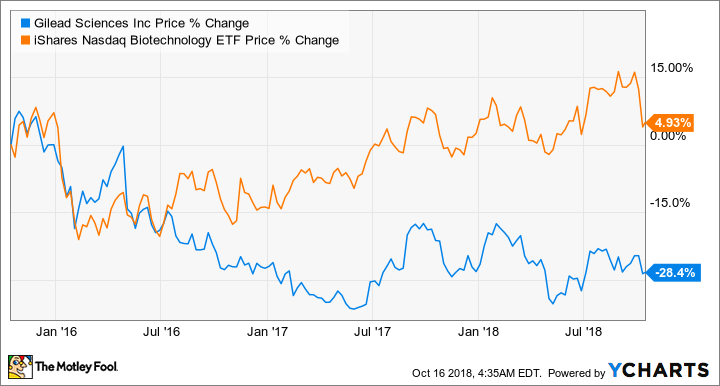 The mid-cap biotech Intercept Pharmaceuticals (NASDAQ:ICPT), for instance, appears to have a far brighter future than Gilead, perhaps making its stock an outright better buy right now. With a price-to-sales ratio of 18.9 at present, Intercept's stock might not look like an outright bargain. But a deeper dive strongly suggests otherwise. And Wall Street seems to agree with this assessment based on the stock's average 12-month price target of $134.6. This rosy outlook, after all, implies a healthy upside potential of nearly 34% at current price levels. What's driving Wall Street's optimistic view of Intercept's growth prospects? While the company already has its farnesoid X receptor agonist, Ocaliva, on the market as a treatment for primary biliary cholangitis (PBC), the value proposition really centers around the drug's forthcoming late-stage results for nonalcoholic steatohepatitis (NASH). Those landmark results, if positive, will be a game changer for Intercept and its shareholders. NASH, after all, is one of the largest untapped drug markets, coming in second to only Alzheimer's disease in terms of total value. Current estimates, for example, suggest that the NASH drug market could eventually reach a handsome $35 billion in annual sales. The particularly intriguing part of this story, though, is that Ocaliva has a lengthy head start over the swath of other experimental NASH drugs in development right now. In fact, Intercept is hoping to unveil Ocaliva's first set of NASH late-stage results in the first half of 2019. So, if things work out according to plan, Intercept stands to have the high-value NASH market to itself for anywhere between one to two years. Rival therapies from Madrigal Pharmaceuticals and Viking Therapeutics, after all, have yet to even enter into their respective late-stage programs. Madrigal and Viking might also delay the development of their lead NASH assets in order to license them out to larger partners -- potentially giving Ocaliva an even larger first-mover advantage. Bottom line: Intercept may be sitting on one of the most valuable experimental drugs in late-stage development, and its current market cap of $3 billion simply doesn't reflect this possibility. Intercept is definitely an eye-catching growth stock. Ocaliva's monstrous commercial opportunity opens up numerous avenues for share-price valuation, after all. But there is a serious risk with this company that shouldn't be ignored. Ocaliva does have a somewhat problematic side effect profile that may keep it from rapidly penetrating the NASH market -- assuming positive trial results followed by an approval next year. Put simply, doctors may choose to restrict Ocaliva's use to only the sickest of patients, while other safer drugs make their way to market. That's not to say this is a definite outcome, but it probably is a key reason the market has yet to bake in much -- if any -- of Ocaliva's NASH opportunity into Intercept's valuation. As proof, Intercept's shares are only trading at about six times Ocaliva's estimated peak sales for just PBC, which isn't an overly rich long-term valuation for a biotech by any means. In all, Intercept is a risky growth play, but one that could pay off handsomely if Ocaliva does become the first approved NASH treatment. Aggressive growth investors, in turn, might want to start grabbing shares ahead of Ocaliva's next clinical update.